Spring is just a few days away and that makes for the perfect time to clean, purge and organize. Whether you need to tackle that daunting broom closet or find a home for that mountain of wrapping paper left over from Christmas, the Jigsaw design team has some helpful solutions in this post. 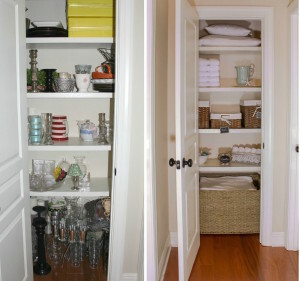 Let’s start small with a linen closet/catch-all to get motivated by quicker results. Once you start to clean and purge in one place, everything else starts to look disorganized as well and you’ll soon be moving on to bigger projects. 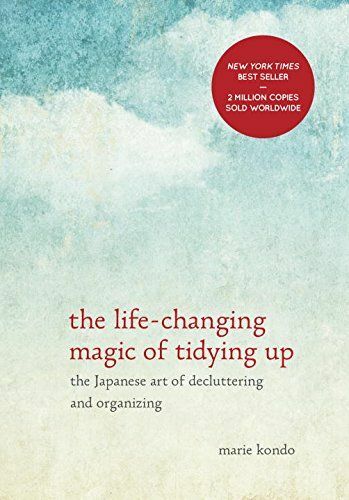 Marie Condo’s audio book The Magic of Tidying Up: The Japanese Art of Decluttering is a perfect companion to keep you motivated to purdge. In her book, she encourages you to let go of items you’ve been hanging on to for too long. You’ll feel better and your house will feel light and airy. How to purge? Throw it away, unless you use it regularly or it serves a purpose more often than not. Avoid going through sentimental items during the process. It slows you down and you’ll likely keep everything you take down memory lane. Put those items in a bag to sort through at the end once your job is complete. 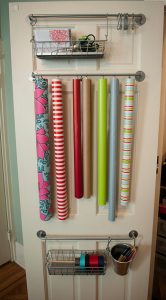 Now that you’ve purged and cleaned, it’s time to organize your keepers in boutique style. 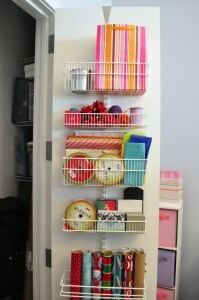 Purchase matching baskets for small items, label items or shelves just do whatever will make your life more efficient. If you don’t have a craft room or large laundry area, add baskets and hangers on the inside of a closet door to store that mountain of wrapping paper. It will be at your fingertips quickly and easily and stored nicely out of plain sight. The Container Store and Ikea are great places to find easy install wall mount baskets. April showers bring May flowers…as well as mud into the house. Contain the pile of shoes, umbrellas and backpacks at the door by creating a mud-room. 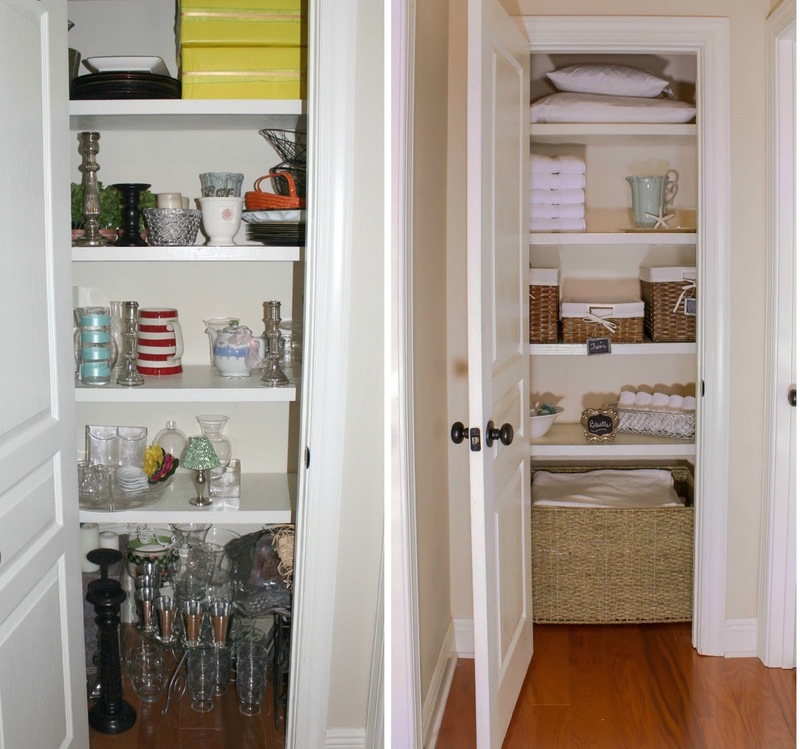 An organized shelf in your garage can do the trick, or if you have a coat closets that you can spare in your entry, viola, you have an instant mud room (or mud closet-close enough). Remove the doors and add a bench style seat, maybe a shelf, Monogram the wall, whatever makes your home flow in a stylish way. 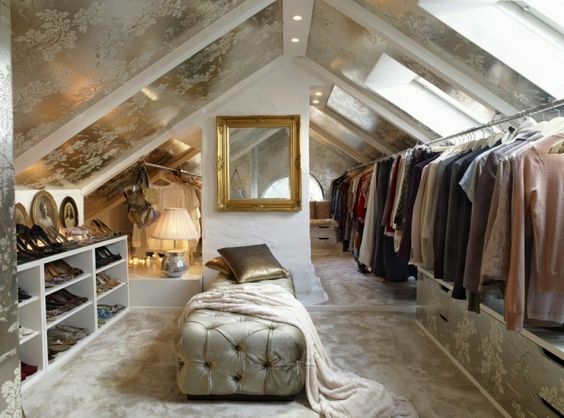 What every girl wants is a dreamy walk in closet. 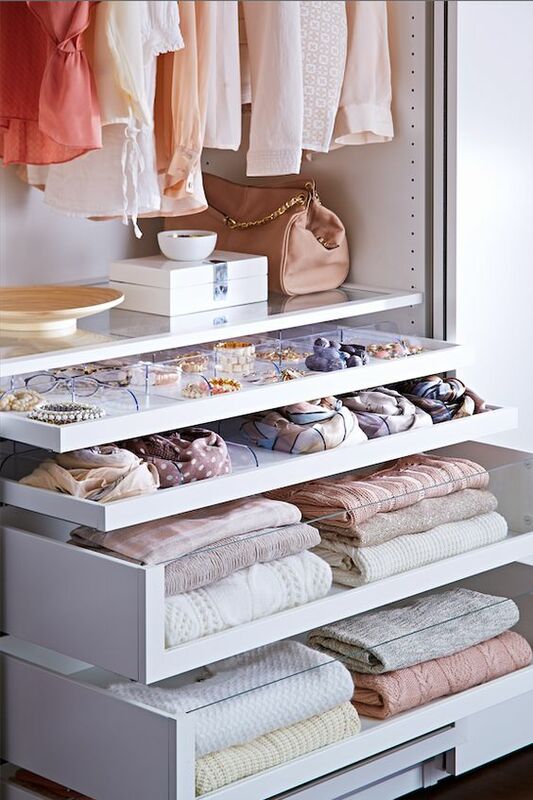 Whether you have the luxury of space for a walk or not, you can use the steps above to organize your closet to fit your busy life. Add some wallpaper behind your shelves for a little pizzazz, or a chandelier to make you feel like a queen. 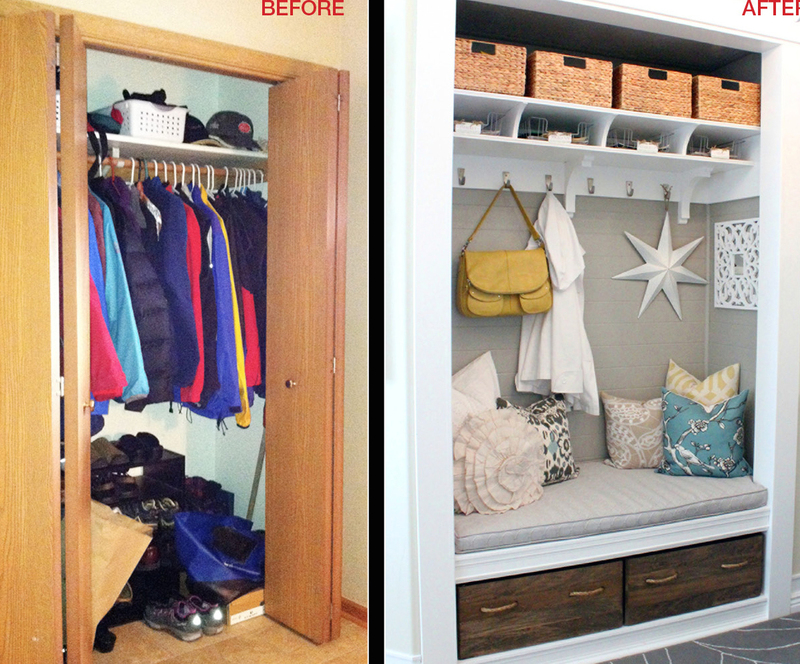 Jigsaw Design group completed this closet renovation in the images below. The square closet before was lined with a shelf to high to reach and hanging space only. The team went in and added drawers, multiple layer shelves and hanging dowels to make it fully functional. Then an added an ottoman for dressing, and a chandelier for that extra special touch. 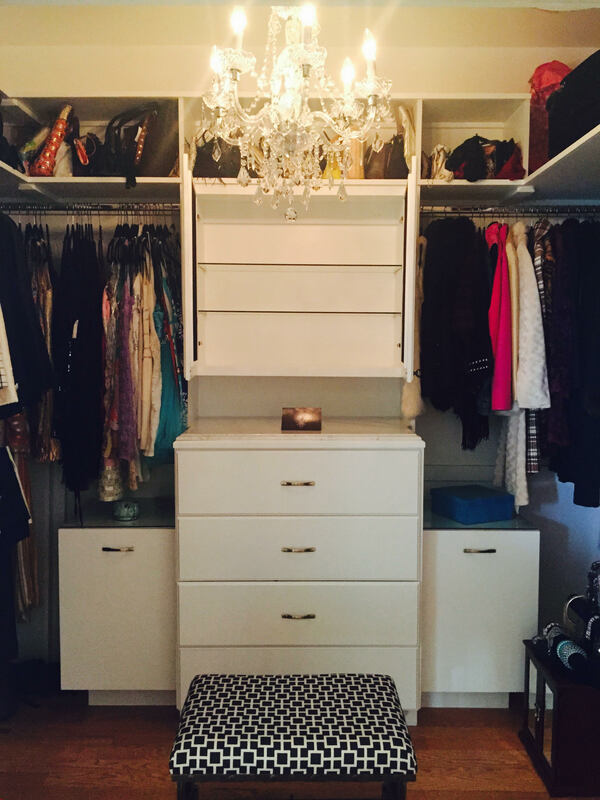 We recently caught up with the client who is madly in love with her closet and she has been able to keep her new space perfectly organized for the last year. That is the mark of excellent design. For more information on closet renovations and resources visit the contact page on the Jigsaw Design Group website at www.jigsawdesigngroup.com. Someone will quickly contact you with more information. Please subscribe to the blog for more informative articles like these, and check out our Facebook page for more tips and images! Be sure to ‘like us’ on Facebook! Now join us on Googleplus too! 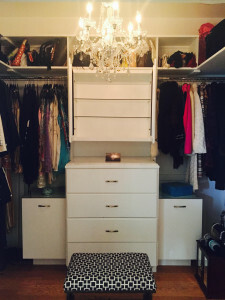 Jigsaw Design did a complete redo of my closet which is mentioned in the March 6 blog. The last two pictures are the final product. I LOVE my closet. It is very functional as well as beautiful. 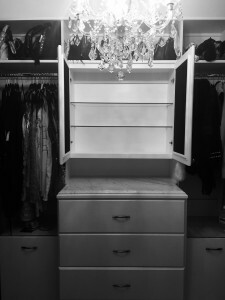 My old closet was so cluttered and unorganized which made me frazzled getting ready for my day every morning. 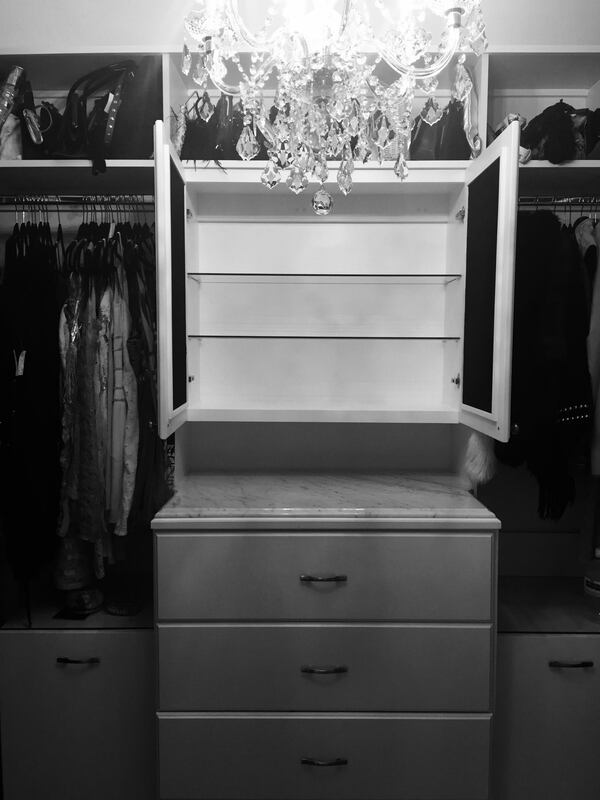 JDG created such an organized and functional closet which helps keep me calm in the mornings. NO MORE digging under boxes and shoes to find things. The quality of the cabinetry and other materials used are excellent. Thank you Jamie for your lovely comment. A happy client with a simpler life due to our design is the ultimate satisfaction to our team!